Fresh pureed corn is wrapped in its husks and steamed until firm. 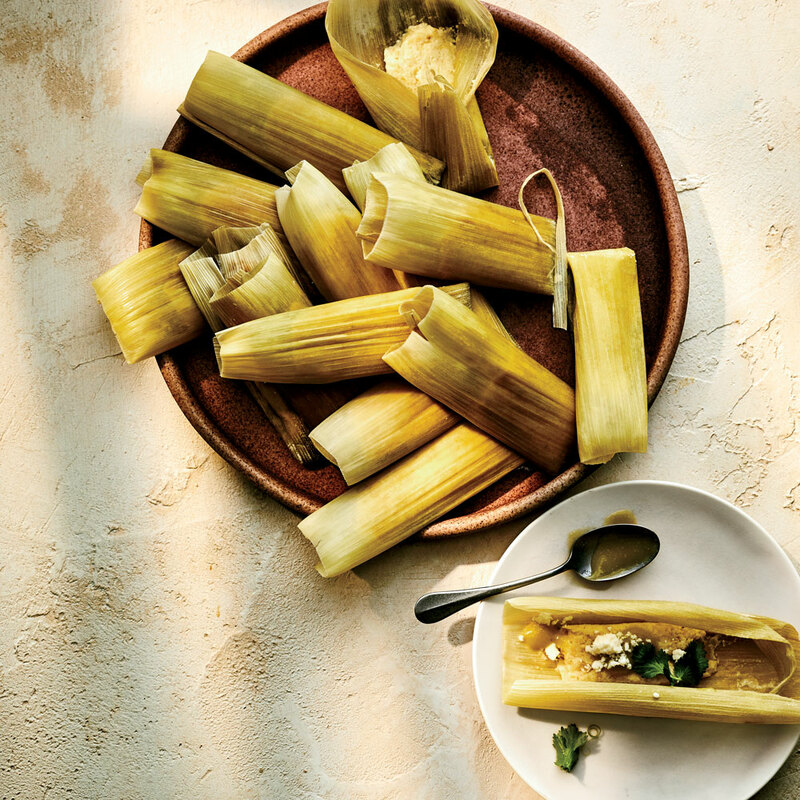 The resulting sweet corn tamales are delicious served with salsa verde. Cut off excess corn silk from top of each ear of corn. Cut off ends of ears of corn just above base, so husks are detached from stalk and can be easily removed. Carefully remove husks, keeping them whole by holding middle of each husk leaf and gently rolling it off. Separate at least 20 bigger, thicker outer husks (you’ll want a few extras in case some tear) from smaller, thinner inner husks. Gently rub husks with a damp kitchen towel to remove any dirt. Set aside. Rub a clean kitchen towel over kernels to remove any silk (or rinse under cold running water to remove silk, and pat dry). Working with 1 ear at a time, stand corn cob up in center of a piece of parchment paper or a rimmed baking sheet, and cut corn kernels off cobs to equal 5 cups. Reserve any remaining corn kernels for another use. Process corn kernels and milk in a food processor until corn becomes a textured, coarse puree, about 5 minutes. Place crème fraîche, butter, sugar, and baking powder in a small bowl, and whisk until just blended. (Do not overwhisk or the mixture will separate.) With food processor running, pour crème fraîche mixture through food chute, and process until combined, about 1 minute. Add salt, and process until blended, about 30 seconds. Taste and add more salt, if desired. Place corn mixture in a fine wire-mesh strainer set over a bowl. Gently stir corn mixture (without pressing down) for 10 seconds. Let mixture sit, undisturbed, until excess liquid (1/2 cup) passes through strainer, about 1 minute. Discard 1/2 cup of excess liquid. Transfer strained corn mixture to a medium bowl. Place a metal spoon in bottom of a stockpot; fit stockpot with a steamer insert, and add water up to but not touching bottom of steamer insert. (The spoon will rattle as the water evaporates, signaling that you need to add more. Keep a medium saucepan of water simmering so that you can refill the steamer as needed.) Line bottom of steamer insert with a layer of smaller fresh corn husks. Bring to a simmer over medium-low. Shingle tamales horizontally (with open end tilted up) in steamer insert. Cover stockpot with 2 clean kitchen towels. Wrap plastic wrap around top of stockpot to keep towels secure. Top with a third kitchen towel, and weight with stockpot lid. Cook over medium-low until corn mixture inside tamales has a pudding-like consistency, about 1 1/2 hours. Transfer tamales from steamer insert to a platter, and cool 8 to 10 minutes. (The tamales will firm up as they cool off.) Remove and discard corn husks in steamer insert. Serve tamales hot, smothered in salsa verde and topped with Mexican crema and crumbled Cotija cheese.